Somerset, NJ, January 29, 2016 (Newswire.com) – Spot ’n Spell, a spelling app for children aged 4-7 years, has been picked by the premier app review website as one of the 16 educational apps and games worth adding to any digital teaching kit. 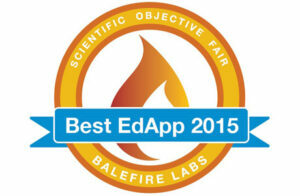 The Best EdApp award is given to educational programs that have “strong instructional design and usability”, according to a blog post from Balefire Labs. Spot ’n Spell made the cut in 10 out of the 12 qualifying checklists, including positive reinforcement, error feedback, progressive difficulty levels, error amendment, mastery-based instruction, interactivity, well-defined learning objectives, relevant audio and visual aids, availability of learner support, easy-to-use interface, age-appropriate reading level and scorecards. “We are looking for objective feedback from independent reviewers, parents and teachers to improve our product line in terms of latency, speed and user interface. Given the amount of data we collect, our continuous improvements in those areas will make ColorsKit indispensable in the world of instructional learning and gaming,” Nish added.